PLUS! BuzzFeed readers get 15% off with an exclusive code! Salutations, fellow ModCloth lovers! As we're all already aware, looking at this store is always just one big "I WANT THAT" experience. But sometimes things are $$$ and deals can be few and far between. ^^^ Me looking at my cart of $800 and realizing my piggy bank only holds $10. But REJOICE, because now BuzzFeed readers get ~15%~ off purchases of $100 or more with our exclusive code: SEPT15!!! Psst: You have until September 30 at 11:59 pm ET to use it! 1. A ruffled midi dress, because we're going to need something cheerful to wear as we approach five months of gray skies and probably daily rain. 2. A portable charcoal grill that'll come in handy when you take your next camping trip. Why even go if you can't have hot dogs? This bad boy comes with a navy briefcase exterior, mess-free ash catcher, essential tongs, and sturdy base! 3. A belted wide-leg jumpsuit with a houndstooth bodice for actually looking forward to getting dressed for work. Dare I even say...excited? 4. A plaid halter swing dress so you can put a *bow* on the already best time of year: fall. Do not argue with me, you know I am RIGHT. 5. A pair of ruffled suede peep-toe heels, because it's time to put your foot down on boring basics. Your feet deserve to live a little. 6. A quilted parka with a removable faux fur hood that'll actually keep you toasty warm during the winter, minus the Canada Goose prices. Save that money for holiday gifts (for yourself). 7. A romantic lace dress with a gilded sheen and layers of tulle for a gorgeous take on modern wedding styles. You may receive several more proposals on your big day. It's also available in green, black, and cream, so this also makes for a great bridesmaid or wedding guest dress! 8. Or! A belted floral lace gown so you sweep everyone away in a number that looks like bridal couture, but costs a fragment of its expected price tag. 9. A pair of Sperry insulated rubber rain boots, because these will keep your piggies ~high and dry~ from stormy weather. Soggy socks are a thing of the past. 10. A long-sleeved flare dress with a high-low hem, knit top, and POCKETS! I think we just found the trifecta of a perfect fall dress. Let me pass the tissues. 11. A BB Dakota houndstooth coat that'll prove you can have it all, thanks to its chic double-breasted buttons, subtle pockets, and ruffle hem. Finally, a topper that *doesn't* ruin our outfits. 12. A dot-embroidered mesh dress for discovering a consistent ~pattern~ of compliments every time you wear this. 13. A light-up globe so you can catch up on all that geography you've definitely forgotten since fifth grade. This boasts capital cities, natural features, and honestly just looks really impressive when plugged in. 14. A pair of dark wash high-waisted jeans, because despite looking retro their Lycra-infused, flexible fit will never go out of style. Tl;dr: these will actually be comfortable to wear. 15. A patterned silky dress with puff sleeves and a cinched waist that'll give overpriced designer dresses a run for their money. 16. A pair of embroidered block-heel suede booties for elevating your look while staying comfortably low to the ground. 17. A satiny trench coat (with a super-cute floral lining!) so you can ~top off~ all your favorite looks with something you actually want to show off. So long, college jacket. We're sophisticated now. 18. An Adrianna Papell sheath dress, because there's nothing basic about this LBD. You'll still 1000% always stand out. 19. A vintage-inspired satin midi dress that'll quickly become your go-to for every formal occasion. The limit does not exist. 20. A belted jumpsuit with dramatically wide pant legs for discovering the magic of one-and-done outfits. Feel free to use all your new free time to sleep until 10 minutes before work. 21. A pair of teal suede booties so you can kick off the new season with the epitome of statement shoes. Boring basics? Never heard of 'em. 22. A fit-and-flare midi dress with a banded waist, cut-out back, and a subtle sheen, because you'll *shine* all night no matter how late you stay out. 23. A hooded coat that'll warmly snuggle you as you brave cold weather. Not to mention this will dress up the leggings you already plan on wearing every day. 24. A versatile maxi dress with a playful slit and removable straps for a bridesmaid dress everyone will actually be excited to wear. Want to shop even more? Of course you do! 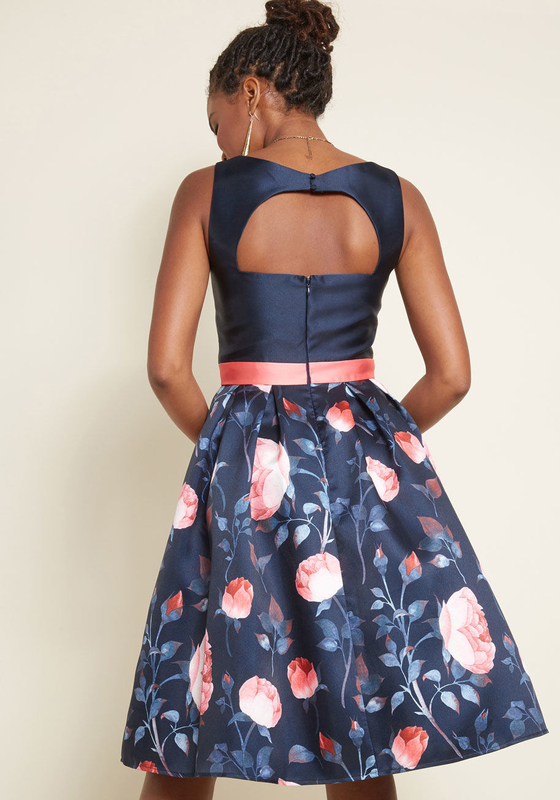 Check out even more from ModCloth's amazing collection to score your new faves. And don't forget to enter our exclusive code: SEPT15!